VBS 2019 is Coming ... Volunteers Needed! CLICK HERE to download the 2019 VBS Volunteer form … we can’t do this without you! FTHM expresses Jesus’ love by providing meals, conversation, prayers and invitations to people experiencing homelessness and marginal housing in the Oakland Area. FTHM also shares the Church’s heart by inviting outside volunteers to see what they are about. Learning to become a pastor in Nigeria is no easy task. Not only do seminarians have to worry about their grades, but they also have to move great distances to go to school, are often isolated, and face constant challenges in securing enough funds to attend. Aside from these challenges, many seminarians even have difficulty finding enough daily food to eat. It is reported that the students attending the Jonathan Ekong Memorial Lutheran Seminary are either at or below the poverty level. One way to combat the challenge of hunger was the creation of a fish pond in which catfish were raised and provided to the students in an effort to increase their daily protein levels. For this year’s VBS our contributions will go toward the purchasing of young catfish to be raised in the pond. Our goal is $500.00 which will help purchase fish, fish food and supplies to maintain the pond. Vacation Bible School: REGISTRATION OPEN! Registration deadline is June 20th. Make a splash at VBS!! Volunteer by May 25th to receive a Zion t-shirt. Registration opens Sunday, May 6th! We went back in time to the city of Jericho, where Joshua and the Israelites marched around the city one time for six days. Then on the seventh day, we marched around seven times and, when the trumpets sounded, we shouted “God is mighty! The victory is won!” The walls of Jericho came down, not because of our own strength, but by the mighty power of God! Through Jesus’ suffering, death and resurrection, God gives us the victory over sin, death and Satan. In Jesus, the victory is won! Today, we met King Hezekiah. Hezekiah tried to solve a problem by himself, but instead made matters worse. He turned to God in prayer and asked for help – and our faithful God helped him in his time of trouble. We can turn to God, our refuge, when we face troubles too. He gives us strength and promises to always be with us. Today, we met King Josiah. Josiah happened upon a book. It was the Book of the Law. This book was God’s Word. When King Josiah read the book, it changed his life. Reading God’s Word led him to repentance. He shared God’s Word with all the people who also repented and turned from their sin. We learn that God’s Word is true and powerful for us, too! Why not share that good news with someone right now? Today, we reenacted the Palm Sunday story when Jesus rode on a donkey into Jerusalem. We praised Jesus as our Savior by singing and waving palm branches. We learned that a donkey is an animal of peace. Jesus came into this world to give us peace, save us from sin and promises us eternal life with Him. He deserves all of our praise! On our final day together, we discovered that Jesus lived a perfect life and didn’t deserve to suffer and die on a cross. He knew that, on the third day, He would come back to life, defeating sin, death and Satan. He gives to us that same victory and promises to give us the Crown of Life - eternal life – a new life without sin or trouble! Jesus is our Savior King! God is mighty! The victory is won! 1st Trinity Homeless Ministry Donation UPDATE! If you’ve put off registering for Zion’s Vacation Bible School which runs from Monday June 19th through Friday June 23rd, there’s still a little bit of time to register … Registration closes TOMORROW (Wednesday June 14th). Call the Church office at 412-221-4776 to register … before it’s too late! Help Send Books to Kids! Sharing God’s Mighty Word is an outreach project that sends Bible-based literature to kids around the US. The project focuses on reaching inner-city kids, Hispanic kids, Native American kids, and kids who are in crisis. It’s not just kids overseas who lack Bibles and other Christian books. It’s also kids within the US — and often in our own communities! The kids who go to school with our kids, who live a few houses down, and who live on the other side of town may have never even held a Bible. Sharing God’s Mighty Word focuses specifically on delivering Bible-based books to kids in the US. And you can be part of our work! Bring pennies, nickels, dimes, quarters and dollars to help send books to kids. Help meet our goal! Visit MightyWord.org for more information to learn about this project and the mission of Concordia Gospel Outreach. Zion Lutheran Church VBS is collecting donations for FTHM! What is First Trinity Homeless Ministry? shares the Church’s heart by inviting outside volunteers to see what we are about. Every first Saturday, between 1:00 pm and 4:00 pm, volunteers distribute toiletries, clothing and other essential supplies in kind donation from the church to those in need. To volunteer please signup through Pittsburgh Cares. Christ uses all types of unique people to share His love. Please prayerfully consider being involved with FTHM. 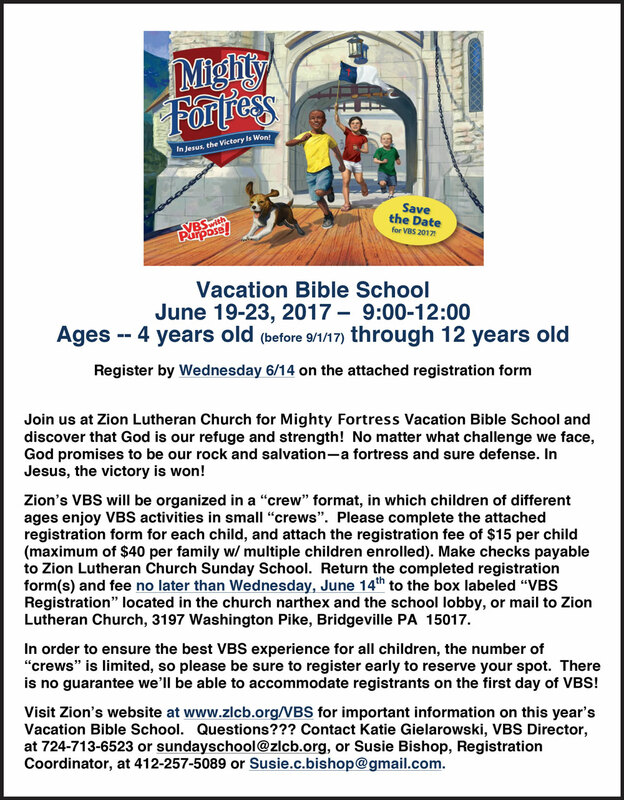 Click on each of the forms below to download Zion's 2017 Vacation Bible School introductory letter and the Registration form. Please download and complete the form below. 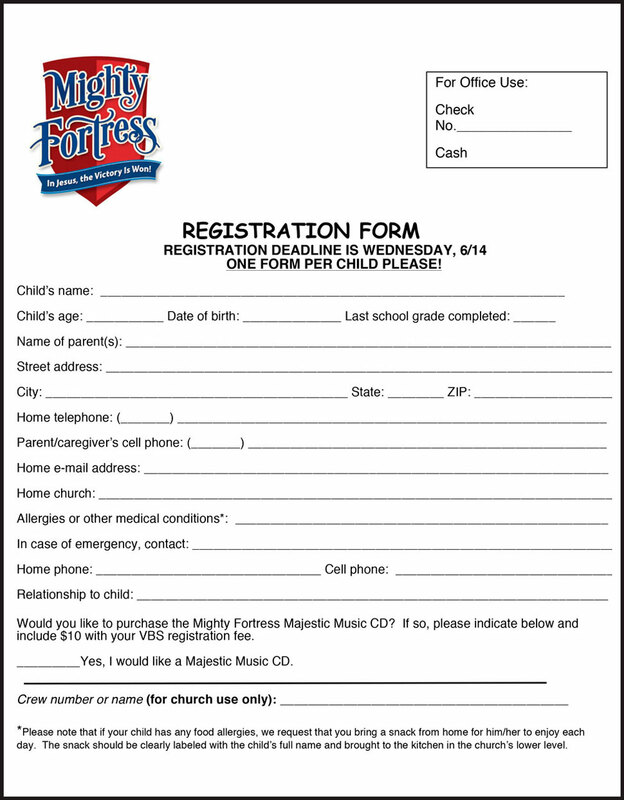 VBS Registration begins May 1st! Interested in leading one of the above stations? What's New at VBS this year? Operation: Kid-to-Kid focuses on helping struggling families with basic home repairs so that they have a safe place to live. Hills. A member of Zion will speak about Concordia and answer questions. FTHM expresses Jesus’ love by providing meals, conversation, prayers and invitations to people experiencing homelessness and marginal housing in the Oakland Area. FTHM also shares the Church’s heart by inviting outside volunteers to see what we are about.